Identity: it’s what defines you, it’s what drives you “you” and it’s how you see yourself. Now, as you may be reading in a language that is foreign to where this piece of writing is being published, you might have a complex, different, mixed, or interesting identity of your own. How come? Well, I tend to relate identity to different countries, languages, and cultures. Everyone has their core identities, usually what they are born with, for instance, their places of origin, their primary language or languages, and culture, just like a plain cup of frozen yoghurt before getting any toppings on it. Then, later comes the secondary identities that we develop from our living environment, our gained knowledge, our language acquisition, and what and who we encounter. These secondary identities, which I relate to as the toppings on this plain frozen yoghurt, tailor our very common core identities into much more personal and exclusive resultant identity. These are ultimately the identities that we present to others. Knowing these, how would you answer the question: who are you? I’d answer that I’m a bridge between Japan and China. I was born in Japan, but I have a Chinese parent. I was brought up in Japan until the age of seven, when I moved to China. I went to the Japanese School of Beijing, which was technically identical to studying in Japan. Later, I transferred to an international school, but still go back to Japan twice a year to visit my family and friends. It may seem fun to be this “bridge” between Japan and China, but being so, however, isn’t merely about living and visiting both countries and speaking both languages. It is much more complicated, engaging, stimulating, challenging, and sometimes frustrating than that. How so? Well, instead of endlessly writing about my own case, I will introduce you to three inspiring bridges, who I interviewed and talked about their idea of being a bridge from their own career based perspectives. People are used to making generalizations, even if this is just based on one person. Studying abroad can be a life-changing experience, just as it was for Andrew. Not only does he want to ensure these opportunities for students in China to experience them but he also wants to ensure the quality of these experiences. By doing so, he achieves something fascinating as a bridge. He further builds and stretches this bridge. The idea behind this is that Due West is the beginning bit of this bridge, but the students become the largest part of the bridge as they learn about and develop through their experience of crossing over to the other side. That enables and stimulates them to mix these experiences with their own core identities to eventually become this object connecting the two cultures. Therefore, as Andrew stressed, understanding both sides of the bridge is how you bridge cultures, because if you don’t, you’re a bridge standing upright on one side not knowing where and how to lay the other end of yourself. Now that we’ve learned about the primary step to becoming a bridge, it’s time to think about the responsibility of being a bridge. “What does it mean to enter a foreign country?” we asked Fumi Katakura, founder of Fumi & Flowers. Fumi sells and arranges flowers imported from Japan and teaches Japanese-style flower arrangement here in Beijing. The fact that she was born and raised in the port town of Kobe naturally enabled her to interact with many Chinese people, and made her understand more about Chinese culture, specifically Chinese literature. She enjoys and values the ideas conveyed through these books, much like how some people are obsessed with those inspiring quotes you sometimes see on Pinterest. Eventually, Fumi’s interest in China and her passion for flowers encouraged her to start Fumi & Flowers. Upon her arrival in Beijing, the weight of the responsibility of being a bridge felt much more realistic and heavier. She realized that opening the door of another country meant much more than just entering; it meant that she was representing her country. Everything she did or said now represented Japan. Theoretically, it does sound wrong, but in reality, that is what a bridge must deal with. People are used to making generalizations, even if this is just based on one person. And that is ultimately why one has to be responsible for their behavior and speech when bridging together cultures. A person indeed is a very small part, but hey, how many people does one person meet within a lifetime? Probably countless, right? Finally, David Weeks, co-founder of the National High School Debate League of China (NHSDLC), founded in 2012 as the first American Public forum debate league for high school students in China, likened debates to a bridge. “Debate is far more valuable beyond what one memorizes about the topic, as it rather is a rich community of engaged students.” Being a bridge doesn’t merely mean the temporal exchange of cultures, languages, or traditions, nor does it simply mean mastering the practices of both sides. It means that we, as bridges, are constantly fostering and expanding a huge community of different backgrounds, cultures, languages, traditions, and histories, no matter which two countries or cultures we bridge. “Crossing cultures – it’s a way of trading identities,” Weeks said. It’s hard to recognize the presence of such a big community within such a busy world of constant identity politics, but it’s crucial when understanding the purpose of being a bridge. David introduced the American public forum not only because he debated in this style when he was a high schooler, but also because it is helpful to those who speak English as a second language. Because the public forum is a mix of research and speaking, it is not limited only to native speakers, but rather encourages those who work hard and come up with better arguments, no matter what nationality may be. Therefore, although it is challenging, it is not limited. Thus it enables the Chinese debaters to feel comfortable crossing the bridge to the American culture of discussion. Being a bridge, while not only being about experiencing new cultures, representing your culture, and then sharing your culture with others, it is essential when attempting to exist in a culture that is not your own. It is hard to be accepted if you are not willing to allow others to comprehend your own point of view. And that leads us to a take-home question from Weeks for all the bridges. “Do people feel comfortable crossing the bridge?” It is our priority as bridges to make sure that people do. 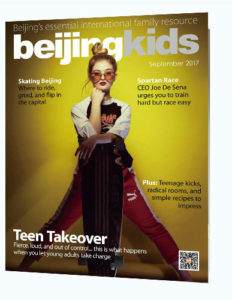 This article originally appeared on p34-35 of beijingkids September 2017 issue.